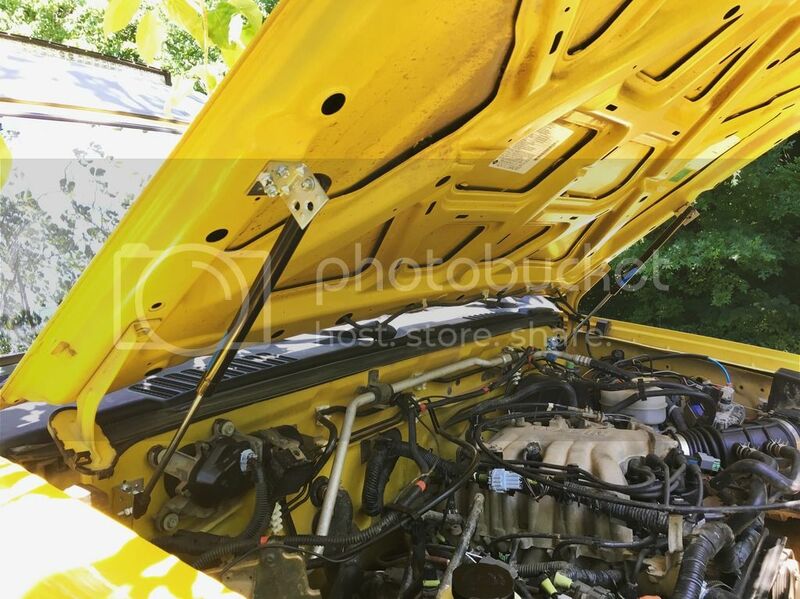 This is a write up on how to install hood struts so you don't have to deal with that annoying hood prop anymore. Cost: Unknown....I apologize for this, my buddy had them laying around. If you do it please let me know so I can edit this. I'll start by saying that my buddy had these laying around so I didn't have to order them...but I did find their website and will post the link. Here is the link to the struts that I have on my X. They are 90lbs of force each. Which is overkill. I'm sure the 60lb struts will work just fine, but I havn't tried them so if you choose to go that route please fill me in. I think he may have gotten the mounting brackets from somewhere else because I can't seem to find them on their site. But I'm sure any of those 90 degree brackets with a 10mm ball will work just as good. Okay, so now you have your struts and brackets. The first thing to do is find your mounting points. What I did was attach the mounting brackets to the struts and hold them where I thought was a good place on the firewall and hood. I tried to find the flattest points that I could, and was sure to check that they wouldn't hit anything when closed. Then as I was holding them where I thought a good spot would be, I simply took a fine point shapie and poked it through the mounting holes to locate where my screws would go. Now it is just a matter of center punching where the holes will be drilled, drilling and tapping the holes. I started with the bottom mounts then after I got those mounted I attached the struts so I could just swivel it up to where the top mount would be then marked those holes. It was definitely easier than trying to mark all holes while holding everything perfectly in place. BE SURE TO WATCH OUT FOR....On the driver side (on first gens, not sure about second gens) Be sure to mount the strut high enough as to clear your brake lines in the engine compartment. Especially if you don't have a body lift installed. I also routed my windshield sprayer hose on the drivers side in front of the strut for less tension. Here are some pics to help you along. Take note of the direction of my mounting brackets, I found by orienting them that way it was easier for me to find a good flat surface. These looks like a sick mod to have. One day when I get the spare time, I will get around to this. It literally takes less than an hour to do. Esp if you have mechanical skills and are comfortable power tapping 1/4 20's. Well it is that and also having a place where all tools are available.. I am off at college right now, so I have little to nothing.. I love my hood struts, they look as awesome as they perform! Nice write-up, too! I really want to do this soon. But I'm with Tucker, finding all the tools in a garage that my brothers have WRECKED is tough. Ugh... I don't even know if we have a working drill right now. Anyways, great write up. Thanks! im writing this one down on the to do list! This might be the easiest yet one of my favorite mods. It's easy to do and they work great while keeping the rod out of your way. @ Church.....glad you're enjoying them. 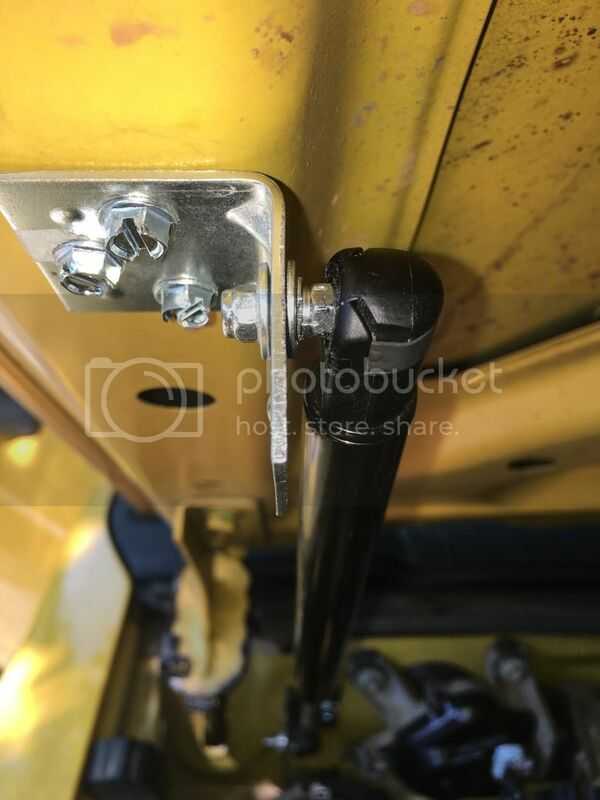 Ahhh, I think they rebuilt their page, I'll fix the links when I get time but in the mean time here is a link to the gas springs (mounting hardware is not included). Also it says their online ordering is being repaired so you might have to wait to order. It's the bottom one. I'm pretty sure the 60 lb ones will work too but I havn't tried them so I can only vouch for the 90 pounders. I don't see prices for the struts...I'm guessing I gotta call? The struts I used (Stabilus Genesis 1164UL 0540N) show up on eBay for $15 each, FWIW. Where did you buy the mounting hardware? Local junkyard COULD have these. Another one off those things I wish I had ripped off my jetta before I sent it to the scrap yard. I hate having to use the stupid prop bar. Maybe one of these days I will get some and throw on the truck. Hey guys. I really want to do this mod on my Xterra. 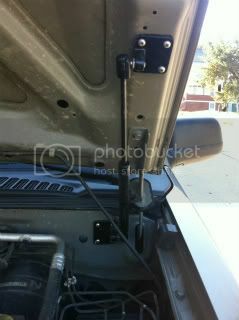 Can any one of you send me a link of the gas strut and bracket from austinhardware. 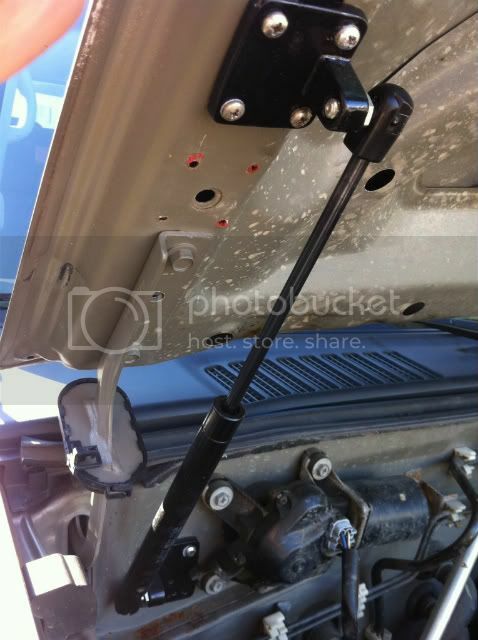 I looked on their site but can not find information about the struts they sell. Any help would greatly be appreciated. Thanks!! As far as struts, a few posts back I posted the part number for the Stabilus Genesis struts I used. Should be able to cross-reference that number for specs and/or find a listing for them just about anywhere. McMaster Carr, Rock Auto, Amazon, local parts store, they are still listed on eBay, etc. Any thoughts on the length of the struts? Thanks! I have a pair of these sitting in the garage just waiting to be slapped on. Soon! Maybe you could read KChurch's response and do some investigate research on your own, instead of posting your response twice in the span of 27 hours. Also, it may do you some good to post what year Xterra you're asking about. Doing my own research, it appears you have a 2002. Research, man. Here's my version using 4339 Strongarm struts and brackets and hardware from Lowe's. I had to do a little rigging using a M4 bolt, it's probably not ideal but it works! you got a link by chance? @Cptpackrat - I found these but neither are $10. I'm thinking the heavier ones would be what we need. I got this done today. These are the 67 lb from Amazon, and they work great. Not a big job but very nice not having to deal with the prop rod. Ok, I must do this. The 67 lbers aren't too strong? The OP says mark and drill holes. I was thinking self tap screws, any downfall to using them? No, the 67 lbers are not too strong. I wondered about that too. When I got them I tried compressing them manually and it was a b*tch. I went ahead and put them on. One will not hold the hood up, but two do with ease. In fact, if you let go too early the hood will kind of slam open, so watch that. You can pull it down with your pinky. I always do pilot holes for things like this. Used #14 x 3/4 sheet metal screws with flat and lock washers. Just be sure to give your ABS lines room.